"We are proud to be suppliers of British made fire extinguishers." Our equipment is manufactured to a high standard ensuring you quality and reliability. All units Carry the British Standard Kite mark, and made to British Standard EN3. We can supply any type and size of extinguisher from the standard red units to stainless steel. We hold a small stock of units at our head office in Hastings, East Sussex, and can turn around extinguisher supply within 72 hours. Blankets - Firechief Fire Blankets are another core product within the range. A well-proven part of any fire fighter's arsenal, these blankets are all approved to BSEN1869:1997. Not only do we supply fire extinguishers but we are qualified to commission them. 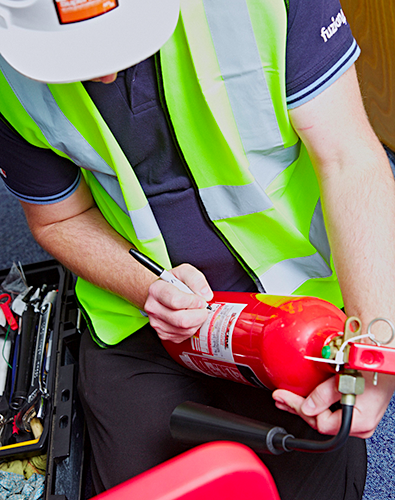 Having your extinguishers commissioned and maintained by a qualified company will ensure you comply with your insurance requirements. Our flagship brand, represents quality, reliability and experience. Established for over 12 years in the UK fire market, the Firechief brand is widely recognised and trusted by resellers and end-users alike. Having recently expanded our range of UK developed extinguishers, the Firechief family of sub-brands has grown yet again. The name says it all. For those applications that need extra fire fighting capability, watch out for the PowerPlus logo. This growing range can even boast of having one of the most powerful 6kg powder extinguishers currently available. Extra power with the added benefit of extra protection for the environment! We all realise the need to take more responsibility for all things green and that is exactly what these extinguishers will help you to do. When red simply won't do, go for silver! Designed for 'design sensitive' interiors and harsh environments, the polished finish of these extinguishers always look the part.